In January 1962, as Chandra was to do a couple of years later Erapalli Prasanna made his Test debut in his first First Class season. He was 21 and studying for an engineering degree when he was called into the Mysore Ranji Trophy side. His early performances were encouraging. He was never collared, and he took his share of wickets, but it was still a major surprise when he was called into South Zone’s side for the Duleep Trophy final. Another good performance kept him in the public eye, although two early appearances against Ted Dexter’s England side brought just five wickets. He had done enough however to be called up into the Test squad for the fourth match, won by India comfortably, with Pras doing the twelfth man duties. Between the fourth and fifth Tests Pras played against the tourists again, this time for South Zone, and it was in this game that he really made his mark. In their first innings England were dismissed for 193, their lowest total of the tour, and Pras took 6-56. Some inept batting cost South Zone the match but in a bold change of direction the selectors dropped an opening batsman and a quick bowler from the side that won the fourth Test, and replaced them with Pras and Bapu Nadkarni, an orthodox left arm spinner. This positivity was rewarded and the fifth Test was won as well, and convincingly. Pras bowled economically but on this occasion the matchwinner was left arm spinner, Salim Durani. Pras took only a single wicket, but he had impressed sufficiently to get a place in the party that embarked for West Indies shortly afterwards. As his career progressed Pras seldom got too much in the way of support from selectors, but back in those early days he did get a break or two. He had not expected to play in any of the Tests in West Indies but was, to his great delight, called into the side for the second Test at Kingston. India had been badly beaten in the first Test and were to be similarly mauled by the West Indies pace bowlers in the next four as well. At Sabina Park the home side piled up 631-8 before declaring, and those runs proved to be sufficient to win by an innings. Pras was India’s best bowler, taking 3-128 in 50 overs. He bowled well and tells a story of West Indies skipper Frank Worrell, on learning the Test was only his second, tousling his hair and saying Son, if you bowl like this you will play in many, many more. He also spent a day keeping Garry Sobers in check, Well bowled, little fella was Sobers message to him as they walked off together at the close of the third day. As he finished top of the tour averages it is hardly surprising that Pras thought that he should have played more, but at the same time the management’s view that the batting needed strengthening, and leaving the off spinning duties to frontline batsman Polly Umrigar was understandable. Just three weeks after Pras returned from the Caribbean his father died. This inevitably struck Pras hard. His father had always been anxious that whatever else he do Pras should qualify as an engineer, and he decided, having made the decision to miss a year of his studies to go on the tour, that gaining that qualification was to be his priority. Not that he became unavailable. He continued to play First Class cricket, but the selectors looked elsewhere. In 1963/64 against England the off spinner selected was AG Kripal Singh, but he only played twice, and the selectors seemed more interested in bowlers who turned the ball away from the right handers. In the fourth Test they played two left armers, Nadkarni and Durani, as well as two leggies, Chandra and Baloo Gupte (brother of “Fergie”). The following summer, 1964/65, Australia and New Zealand came to India. Pras was invited for trials this time, but his exams prevented him attending. By the time the New Zealanders arrived there was another young off spinner who was given his chance, Venkat, and he grabbed his opportunity with both hands. The best part of five years passed before Pras got another real sniff of Test cricket. The West Indies toured India in 1966/67. The first two Test matches were, despite Chandra’s best efforts, lost, and with them the three Test series. Venkat batted bravely but his bowling was unimpressive. Between the second and third Tests the tourists played South Zone, and Venkat and Pras both played. In a curious game only Pras bowled in the first innings, and in the second he bowled just one over and Venkat had a long bowl. The incumbent got a five-for, but Pras took 8-87, and for the final Test the Holy Trinity lined up together for the first time. There was no fairytale win, but to India went the moral victory as only by dint of their eighth wicket pair hanging on for an hour and a half did the visitors avoid defeat. The Trinity shared the wickets around. There were five for Pras, and he and Venkat both made the trip to England in 1967 with Bish and Chandra. Despite both being off spinners, and friends as well as rivals, Pras and Venkat were very different cricketers. Venkat’s bowling was quicker and flatter – in many ways he was a very “English” finger spinner. He was also a fine close fielder, and whilst his Test batting average was only fractionally better than Pras’, he was a distinctly better batsman than any of the Trinity. As for Pras his action lacked the aesthetic beauty of Bish, but he was a very similar sort of bowler. He tossed the ball up, and few batsmen could work out his length as the ball alternatively dipped or held up, seemingly at random. But that was only half the batsman’s problems as, in modern parlance, Pras put plenty of revolutions on the ball as well. He also had his “floater”, a delivery that didn’t turn at all, but to all intents and purposes looked just like those that did. As befitted his training as an engineer Pras was a bowler who sought to outthink the batsman. There were plots and tactics and, like Bish, Pras had no problem with going for a few runs as long as he got his man. the pair weren’t wholly similar however. While Bish would greet the man who hit him for six with a smile and polite applause, from Pras there was only a scowl. For such bowlers a captain who understands their needs and has confidence in them is vital. For India Pataudi was just that. He would almost always give Pras a leg trap of three, and a slip for the floater. If the wicket was helpful, or the batsman looking worried, then silly mid on, silly mid off and gully would go in too. Seven fielders and the ‘keeper round the bat, with just deep square leg and deep mid wicket back. One man who rated Pras highly was Ian Chappell, whose opinion is I thought Prasanna was a genius. He had beautiful flight with his off the shoulder style action. So many times when the ball left his hand, it appeared to be an invitation to a juicy half volley, but it never kept the appointment. I used to wonder if Pras had the ball on a string, which he tugged just as you were about to play your shot. The 1967 Indians shared the English summer with Pakistan. To them fell the first bite of the cherry, at the BCCI’s request, but May and June in England did not really suit spin bowling, and there was no real contest. There were some heroics by India’s batsmen amidst their defeat in the first Test, but the second was just one long disappointment. Pras so far had the distinctly unflattering series figures of 1-339, and would surely have lost his place to Venkat for the final Test had not India’s limited pace bowling resources been depleted by injury. As it was all four spinners played together for the one and only time. It proved an inspired move as England were dismissed for 298 and 203, and Pras was the bowler of the match with 7-111, although the batsmen could not capitalise on the bowler’s good work. his off spin bowling contained the basic principles of length, direction, spin and flight. He frequently deceived batsmen in the air. He spun the ball more decisively than any Australian bowler, indeed, on some days he spun it when no Australian could spin the ball at all. He was rated among the most impressive off spinners to visit Australia since the war. From Australia it was straight on to New Zealand for four more Tests. India had never won a match away from home before, but they took the series 3-1. For Pras it was success all the way. With the slower pitches and weaker opposition his haul was 24 wickets at 18.79. By now Pras was, without dispute, the finest off spinner in the world, and he carried on in the same vein in the return series against Australia and New Zealand two years later. In 1969/70 there were 20 wickets in three Tests against the Kiwis and 26 in five against Australia. 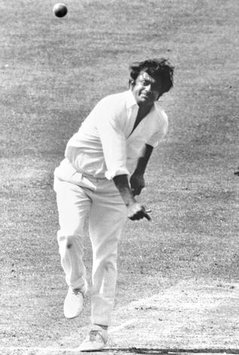 On his home pitches Pras’ bowling at times seemed to mesmerise the Australians, and Wisden compared him and Bish to the great partnerships of the past that were forged by Jim Laker and Tony Lock, and Sonny Ramadhin and Alf Valentine. Despite the genius of her finger spinners India still had frailties however, and they failed to beat New Zealand, drawing that series 1-1, and lost 3-1 to Australia. It was a much improved performance however and a short golden era of Indian cricket was about to start. Sadly however the great off spinner, who had taken 95 wickets in just 16 Tests, was to play only a bit part in the victories that followed, and indeed although he was no great age for a spinner, just 29, his best years were already behind him. In 1970/71 India went back to the Caribbean, the scene of their 5-0 hammering a decade earlier. Little was expected this time but, inspired by a magnificent debut by Sunil Gavaskar, West Indies took the series, winning the second Test at Port of Spain and drawing the other four. Pras took four wickets in the West Indies first innings in that victory but was later outshone in the game by two other off spinners. First the home side’s Jack Noreiga, who played his only Tests in this series, took 9-95 and, as West Indies second innings collapsed to put the visitors in sight of victory Venkat took a five-for. There had been a change in the team dynamics with Ajit Wadekar having taken over the captaincy from Pataudi. Venkat was now vice-captain, and as far as Wadekar was concerned he had joint top billing with Bish and Pras, and was no longer the support bowler, just there to give the big two a break, that he had seemed to be under his predecessor. Unfortunately for Pras he was injured for the third and fourth Tests, and in both of those, as well as in the final Test which he was back for, Venkat played a full part in keeping India in front and he ended the series as India’s most successful bowler by a distance. Next up on India’s schedule was England in 1971, when they finally exorcised the painful memories of their humiliating defeats over the previous 20 years by taking the Oval Test and the series but, with Chandra having rediscovered his touch and Wadekar keeping faith with Venkat to provide the off spin, Pras spent much of the tour kicking his heels. It was not a happy trip for Pras who, despite being one of the senior men in the party, was never consulted about anything and never told what was going on. There had been a row before the team left when the Indian manager saw Pras’ wife getting on the same flight as the players. He was livid, and assumed that Pras was breaking all the rules by taking his wife on tour. He wasn’t, and his wife was travelling to Kuwait. Had Colonel Adhikari thought before he opened his mouth he would have realised that, he having been responsible for delaying the team’s departure by two days, but he seems never to have been able to climb down and apologise. Pras doubtless also suffered, unwittingly, from the selectorial politics, more particularly the Pataudi/Wadekar issue. Pras was seen very much as a Pataudi man, although he was perfectly happy to play under whoever was captain. His problems in 1971 also cost Pras a good deal of money. When he arrived he was approached by Hampshire with a view to his signing for the county for 1972. Discussions continued as the tour went on but, understandably, the county did not have the same interest in a man who was not playing Test cricket. When India returned home to their heroes’ reception Pras, who had in fact eventually been joined by his wife, went to Kuwait to visit relatives instead of accepting the plaudits with his colleagues a step which was, surely, indicative of a considerable schism having developed as the tour went on. Wadekar kept faith with Venkat in the first Test of the 1972/73 series against England, but after he bowled poorly in England’s unexpected victory Pras was back to support the mercurial Chandra in the next two Tests as India came back and took the lead. After the second Test Wadekar was injured, and the captaincy went back to Pataudi, and that was inevitably a more congenial setting for Pras to bowl in. India were never in danger of losing their lead, but Pataudi chose to sit on it, and in the last two Tests the Englishmen got to grips with “The Holy Trinity”, and in 1974, with Wadekar back in charge, they showed no mercy as the spinners were “mastered and plastered”. England won all three Tests, and in the third lost only two wickets in doing so. Wadekar went after that, and with India 2-0 down after two home Tests against West Indies in 1974/75 the side were in apparent disarray. Pataudi had been reinstated as captain, but then suffered an injury in the first Test and missed the second. After that he went back to his old tactics and pulled it back to 2-2, Pras rolling back the years with a spell of 5-5 in six overs in the fourth Test to change the complexion of the game. There was no fairytale win in the decider, but at least the world knew that despite England ’74 the Trinity were not yet finished, although in reality the end was in sight. For Pras he still had his best figures in Test cricket to come, 8-76 in a comfortable win over New Zealand at Eden Park in January 1976, but he achieved little else of note and was out of the side by the time the West Indies leg of that tour ended amidst the bloodbath that was the Kingston Test, where India’s second innings closed at the fall of the fifth wicket, there being no fit men left. By this time Pras felt he and Bish, by now skipper, were drifting apart. The following season saw home Tests for India against a weak New Zealand side and then Tony Greig’s England. Bish, Chandra and Venkat all enjoyed themselves against the Kiwis but there wasn’t a look in for Pras who was not even named in the squads. There was a match before the series started, between South Zone and West Zone which Pras blames for that. In that contest Gavaskar scored a superb 228, punishing all the South’s bowlers. Pras had stomach problems and left the field part way through Gavaskar’s onslaught. A couple of selectors who were present decided the true reason was that he didn’t fancy taking any more punishment. Greig and England were an altogether tougher proposition, and the English batsmen, after 1974 much more confident against the spinners, took their side to a 3-1 victory. After defeat in the first Test Pras was called back into the side for the second and the rest of the series, and whilst he couldn’t change the result his 18 wickets at 21.61 placed him at the head of the Indian bowling averages. The end came two years later in 1978/79 and the first Tests played between India and Pakistan for the best part of twenty years. The Pakistanis, of course, prepared their pitches with a view to drawing the sting of the Trinity, and did so successfully. Pras played in the first two Tests. His two wickets cost him 251 runs and, by now a passenger in the field, his Test career concluded after 49 appearances – it turned out to be a slightly unlucky number, as a quarter of a century later another appearance would have seen him pocket an additional 15 lakhs in the BCCI’s 2012 handout to former players. The fact that Pras’ first Test appearance had come in the year he made his First Class debut meant that there was a certain symmetry in the fact that his last First Class match was in the same season as his final Test. The match was a Ranji Trophy one, against Hyderabad at Bangalore, and he showed in that that many of the old skills were still there. He took 7-70 in the the Hyderabad first innings to force the home side to follow on, but Karnataka couldn’t cut the same swathe through the second innings, and the match was left drawn. After retirement Pras spent years at the National Cricket Academy bringing on future generations. He did not always have an easy relationship with BCCI, and the old off spinner had strong views on many aspects of the game, particularly the treatment of young bowlers whose actions were questioned. He had himself been the victim of a few mutterings in his playing days, and perhaps that was what prompted his concern not that, it has to be stressed, did he himself ever fall foul of umpires. In the end Pras left the Board’s employ and joined the ill-fated Indian Cricket League. He backed the wrong horse there, but nothing alters the fact that he can enjoy a contented retirement, safe in the knowledge that he remains the finest right arm finger spinner that his country has produced. Another detailed well written article. Hard to understand how one so revered now could be almost scorned in his own time. Its features are wonderful . I have seen it.